In chapter 10 Joe returns to the hatchery to find out that the plan worked but who they caught was a surprise. And they didn’t get rid of the others. They took them. “Took them where?” asked Jake. Jake let out a loud huff and sat down. “The kids said they were asked to come to the hatchery and get all of the gray chicks with green legs, but when they got here…Pecky was missing,” said Gilbert. They were afraid that if they bought them, whoever took me would track them down. They didn’t know that Gilbert picked me as the free ‘rare’ breed for you. “Well, we didn’t really believe the note. We thought it was a joke until the chicks started to disappear,” Gilbert snapped, lifting his chin. Jake stood and started pacing the room. Worry and annoyance rolled off of him in waves, filling the room. He scratched his head then stopped and crossed his arms. The chicks disappeared so everyone here just thought they were fatal. Jake sighed and turned to Gilbert. “But they said they would tell us if we met them tonight,” said Gilbert quickly, impatiently shuffling papers on his desk. I can’t Jake. I have to be there. It’s the only way they’ll tell us what’s going on. “You don’t really need to come back. I can, can advertise free chick feed again. Or we can figure something else out,” said Gilbert trying, and failing to look Jake in the eye. We can try the coupon again. Tell your mom that there wasn’t any chick feed left and more is coming in tomorrow. Jake left the hatchery and waited for his mom out front. Something about the way Gilbert was behaving was bothering him, niggling at his brain and making him feel…uncomfortable. Why couldn’t he look Jake in the eye? Was he hiding something? Did he know more than he was letting on? But the worry continued on the ride home and stayed with him through dinner. 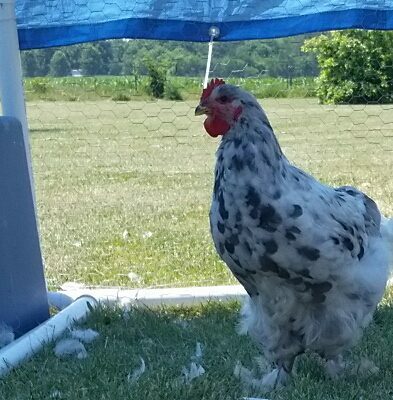 This entry was posted in Chickens!, Pecky Greenleg, Writing. Bookmark the permalink.